Justin Panos of CUPE 3903, Gretta Vosper of West Hill United Church, Gary Wassaykeesic of Mishkeegogamang First Nation, and Steve Watson, Unifor (retired). Photo by Tom Keefer. SCARBOROUGH – As Canada nears its 150th birthday, not every community in the country has equal cause to celebrate. For that reason, a United Church congregation in Scarborough has launched a petition calling on the government of Canada to honour both the spirit and the letter of the treaty relationship with Indigenous Peoples in Canada. The group also wants the Canadian government to take immediate action to address the inequalities between Indigenous communities and the general population with respect to clean drinking water, education, housing, health and social services, and youth suicide prevention in particular. The petition was created by West Hill’s First Nations Study Group and is co-sponsored by the Justice and Global Issues Team of the SE Toronto Presbytery of the United Church and CUPE 3903 representing 3,500 Teaching Assistants at York University. Copies of the petition can be downloaded for distribution. 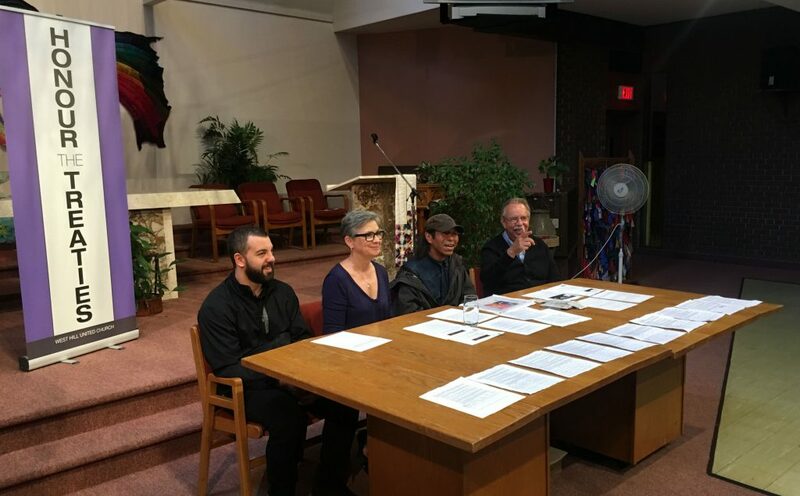 On Sunday, June 25th the congregation at West Hill United Church read the last of the ninety-four recommendations made to all levels of government by the Truth and Reconciliation Commission reviewing the Residential Schools legacy in which the United Church of Canada was complicit. The congregation has been reading one of the recommendations in its weekly Sunday gathering since September, 2015. In a closing event to mark the end of their readings of the recommendations, Gary Wassaykeesic, an Ojibway activist from Mishkeegogamang First Nation, addressed the congregation on the topic of truth and reconciliation. The concluding portion of West Hill United’s ceremony concerning the Truth and Reconciliation report involved making a Two Row Wampum banner with purple strips of cloth that listed all 94 recommendations. As the 150th anniversary of Canadian Confederation approaches, organizers hope that their petition will challenge the Government of Canada to take immediate action to address inequities between Indigenous and general population communities with respect to clean drinking water, education, housing, health and social services. A special emphasis in the petition is youth suicide prevention. Asked for assistance intervening in an Indigenous youth suicide pact last year, Health and Welfare Canada refused citing an “awkward” budget period. In the wake of that decision, three youth in the community have completed suicide. It is this failure to act which has instigated the petition action. In 2013, the West Hill congregation collected 3000 signatures petitioning the House of Commons. The petition was read by Conservative MP Cornelious Chisu, then representing the Pickering-Scarborough East constituency in which WHUC is located. Few of the situations cited in the 2013 petition have been adequately addressed. Organizers have deliberately chosen to keep the petition in a paper format, rather than on-line, as they hope to engage our friends and neighbours in face-to-face dialogue about the issues the petitions raises. The group encourages all Canadian citizens to print several copies and share it widely to foster these important conversations. 1. While the previous government in 2007 promised 25,000 indigenous owned homes within 10 years, fewer than 200 have been built even though Indigenous and Northern Affairs Canada underspent by $900 million what Parliament authorized in the 2015 – 2016 fiscal year. 2. As of October 31, 2016, there were 133 drinking water advisories in effect in 90 First Nations Communities across Canada, excluding British Columbia. 3. On Jan. 26th, 2016, the Canadian Human Rights Tribunal found that the child welfare services provided by the Canadian Government to 163,000 First Nations children and their families fail to meet the standard of government services available to all other children in Canada. 4. Suicides among First Nations youth (aged 15 to 24) are five to six times higher than for nonaboriginal youth in Canada. In July of 2016, the Wapekeka First Nation asked Health Canada for funding to thwart a youth suicide pact. Health Canada refused. On January 8th, 2017, two children in the community took their own lives. 5. While Prime Minister Trudeau promised to lift the 2% cap on annual funding increases for First Nations programming on reserves, a report from the Canadian Press dated June 16, 2016, shows that this needed funding has not yet begun to flow. These funds are urgently needed for education, housing, water, health and social services on First Nations reserves and communities. Fully support this petition: thank you!